Andrew Ross. Nice Work If You Can Get It: Life and Labor in Precarious Times. New York University Press, 2009. In the first dozen or so pages of his new book, Andrew Ross suggests that high-end creative industries (CI) work and low-level service or manufacturing labour have something in common. Both manifest the spread throughout the workforce of conditions of “precarity,” defined by the absence of social welfare, by “intermittent employment” and by “radical uncertainty about the future” (4). CI work, for its part, is at the vanguard of these changes, as CI policy leans on and props up a new rhetoric that turns creative entrepreneurs into models of contented freedom from workplace constraint. Yet a movement is afoot to imagine a “multi-class precariat” (6) united by common goals: promotion not just of any remunerative work, for instance making useless things that waste the earth, but of green jobs that will secure future livelihoods alongside “planetary life” as a whole (10); and creation of regulated flexible employment, maybe including a guaranteed social wage, that would allow people to select their own preferred balance between freedom and security. 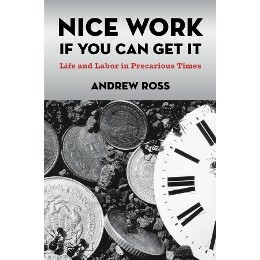 If we are interested in advancing these goals, Ross suggests, we should hold on to some of the core impulses CI management exploits, impulses inherited in part from the anti-work movements of the 1970s: namely, workers’ longing for control over their “economic destinies,” their rejection of routine and heavy management, and their desire for work that manifests their freedom, creativity, and self-direction in “just” and “vibrant” environments (6). Thus for Ross the idea of creative labour can still serve as a progressive model for all work, elite and low-level, mental and manual, valorized and victimized, but only if the “original vision of an existence freed from work-life alienation” can be taken back from its current “perversion” (5) and generalized throughout the workforce. What follows these opening suggestions is a devastating account of what stands in the way. The idea that disparate classes are united by the experience of precarity is soon displaced by a focus on the realities of uneven development in the creative economy. Government bodies and their supporters, first in the UK and Australia but now nearly everywhere, have developed wide-ranging policy frameworks that boast their regions’ unrivaled creative properties. These frameworks tend to present creative work as the pinnacle of enlightened employment in advanced postindustrial societies. Ross shows how intimately tied they are to neoliberalism and to securing property values. He suggests CI talk provides a “new face” for entrepreneurialism, stepping in to fill the void left when the IT “new economy” dot-com boom failed (16), and absorbing IT into itself in the process, since maintaining the existence of a powerful creative economy has involved lumping together arts and culture and software development stats (24). More broadly, CI policies have been rapidly embraced as an inexpensive way to brand one’s polity as friendly to private enterprise and to investment and development. Attracting major manufacturing firms and large corporations requires tax breaks, infrastructure support and the risk of great loss. Appealing to creative labour just means setting up a few coffee shops, some loft-like work-life spaces, and renaming some areas “creative quarters.” Low-level service work may be pushed to the boundaries of this environment, but it hardly disappears. The expressive mental labour of an urban elite, exploited via long hours and devoted dissolution of work-life boundaries, depends upon a core of flexible service workers to whom ostensibly non-creative tasks can be outsourced. The class stratification is thus global and local: a new t-shirt design is born and patented in the creative economy and then assembled for pittance wages in an export processing zone; the creative class moves into and helps gentrify neighbourhoods whose residents were dispossessed when manufacturing jobs moved overseas. Old abandoned warehouses become posh lofts and work spaces, the defunct fire station a restaurant-café. Attending these processes, and helping to entrench the split between high-level knowledge work and less elite employment, is an official romance with the idea of creative work. That this romance is meant to give contingent labour a rosy glow has been emphasized by others. The sense one gets from Ross’s account is that it also helps to convince elite knowledge workers to overlook the growing economic inequalities that make their work possible. They are otherwise an infamously divided legion prone to radicalization, forming the frontlines in battles against programs and institutions ostensibly designed to reward them. Ross discusses as an example the “copyfight” against the intellectual property (IP) regime. For its opponents, IP has become a regressive last bastion of faith in the ownership of the originating creator over her expressive productions, ironically thriving not because artist-originators are its greatest beneficiaries, but because the idea of their uniquely devoted work protects corporate capture of the economic value in what are so often socially authored products. Ross also mentions artists’ opposition to “the industrialization of bohemian cultural activity” (35), for instance to UNESCO’s Capital of Culture program, which sells sanitized versions of a city’s cultural heritage and hides from tourists’ eyes its less attractive residents. In this light, formation of the sort of self who can thrive in the CI environment is hardly a given. It has required instead an active “reeducation” of peoples’ “sentiments” to create a new common sense (75). Particularly useful to the process has been the valorization of a labour profile typical to the struggling artist, which drums up understandable desires for creative and stimulating work, and emphasizes the inherent honour of activity motivated by virtuous non-materialist impulses. All because the real story is so grubby: the CI paradigm will spread so long as it can be shown to help reap value from “collateral, or parasitical, impacts like rising land value” (43), at whatever cost to the social fabric. It may seem like folly to attempt to rescue from this morass an authentic and revitalized vocabulary of creativity, ready to inform “a genuinely progressive industrial policy” that is attentive to public health over private profit (23). If it is foolish, though, it is also extremely necessary, since CI policy will otherwise go on presenting its own mandate as the elaboration of a “progressive” and liberated forward-moving force. Governments now tend to position funding for arts and culture less as benevolent handout and more as an investment in future returns, including wealth creation but also, always in accord with it, public goods like jobs, diversity, access, social inclusion, and civic pride (25). The self-managing individual creative thus blurs into the team player, as does the autonomous artist into the socially-responsible citizen charged with improving everyone’s lot. The pressing questions then are how to change the formula, how to link creativity to the kind of “public good” Ross advocates, how to speak on behalf of workers’ desire for autonomy without adding to the march of neoliberalism, and without fanning the fire stoked by creativity’s boosters since those first management gurus and policy wonks trumpeted the “new economy” and “generation entrepreneur.” Ross offers some answers. His suggestion that we treat creative work as “a basic human right, or entitlement, of the workforce” (47) is one that CI consensus builders like Charles Leadbeater and Richard Florida would heartily support; a worthy sentiment, it is unlikely to lead us out of the current impasse. His other ideas are more exact and compelling. Governments should stop collecting statistics about the size of the creative economy and start polling workers about what a good job entails. Regulations should be put in place to formalize the conditions of possibility for innovation. And the IP regime should be reformed to reflect challenges to the romance of the individual creator, which doesn’t tend to benefit most creative workers anyway. Through changes like these, the current obsession with creativity—how to manage it, how to exploit it, how to monetize it, how to nurture it—can be turned to better ends, and the promise of the desire for creative vocations can inch closer to realization. Whither, then, that multi-class force? When people can choose their own schedules and move jobs whenever they feel stifled, precarity can feel like a personal choice, even for those who make little money and know full well that their ostensibly autonomous desires have been shaped by the powerful rhetoric that makes heroes out of self-directing self-managers. It is hard to stop valorizing CI labour as the workforce with a promise of liberation from alienation at its core. Our conceptions of what it means to be free and creative are so intimately tied to longstanding tendencies to vilify regular, routine, and industrialized employment. Meanwhile, as Ross points out, in less elevated employment sectors it isn’t unusual to experience flexibility as an imposition. Many would like nothing more than a job for life with benefits and a guaranteed livable wage. What else might unite workforces across class divides, then? Why not opposition to capitalism or, at least, to its current neoliberal versions? If the total system of capitalist production is in our sights, then elite creative labour and low-level service and manufacturing workers simply are united. They’re drawn together by their participation in a system that requires, exaggerates and thrives on economic inequality. By Ross’s own account, a strenuous campaign has been required to convince even its ostensible victors that they are the embodiment of autonomous work that is both self-fulfilling and socially responsible. Already active is a core of workers quite capable of looking past the hype and seeing that there is nothing creative about work that, while expressing a social vision or interior life, also expands neoliberal power and capitalist value, and leaves one fairly poor and uncertain in any case. Ross presents capitalism as subject to regulation, responsive to opponents and open to humanization. He suggests our aim should be to “discipline” and “direct” it toward “socially minded investment, fair trade, and more sustainable pathways for populations to subsist on” (210). Thus people can be convinced not to buy certain things and not to support their production (128), and new visions of the self can be fabricated and disseminated and can threaten the neoliberal consensus. Whether these goals are really compatible with something we’d still call capitalism is of course hard to say, and the question is beyond the scope of Ross’s study. What is clear is that “disciplining” capitalism will require a lot of work, and Ross is surely right that academic labour should be taking more of it on. The university is, in Ross’s vision, the knowledge corporation par excellence. We contribute to the creative economy, and our work entails many of the quintessential CI elements, including IP capture, class stratification, and valorization of those who accrue their wealth only incidentally, as a byproduct of their deeper passions (214). We are thus ideally placed to add to and nuance what Ross undertakes in this provocative book: examination of CI policies and vocabularies in relation to a global totality of economic relations; participation in a conversation about creativity and economics otherwise left to policymakers, consultants and managers; formalization of the terms of a better social contract for all workers; and, perhaps most difficult, transformation of this contract into the new common sense. A comprehensive, persuasive account is in Mark Banks, The Politics of Cultural Work (London: Palgrave, 2007). Sarah Brouillette is an associate professor in English at Carleton University, where she teaches post-WWII British, Irish, and postcolonial literature, and topics in print culture and media studies. Her first book, Postcolonial Writers in the Global Literary Marketplace, was published in 2007. Her current research concerns the appearance of the word “creativity” in government policy and business and labour management theory.